Humans vs Zombies is an annual tradition at Midwestern State University. Students begin as humans and are slowly turned into zombies by either being tagged by another zombie, or failing to do a mission. This event is a week-long activity and includes a host of students from all across campus. We created the campaign to boost the game’s traditional value for MSU. By the end of the week, everyone on campus was talking about it. Faculty and Staff even wanted to be apart of the festivities. Only one student, could come out on top, and after nine days, the game was over and everyone had a great time. 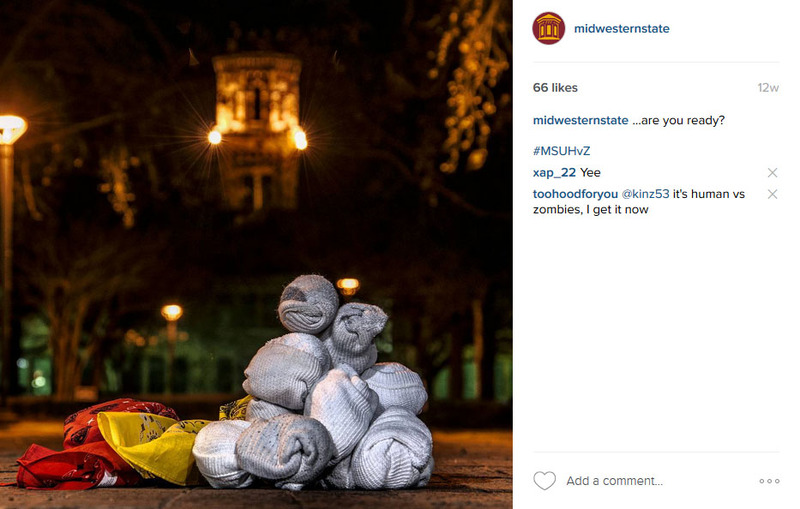 This is how we promoted the game and created a zombie culture on campus for a week. Three weeks before the beginning of HvZ, we sent this instagram image out along with putting it on our one TV display in the student dining area. After the initial images, we began to throw out 15-second spots on Instagram and Twitter. We would have made them longer, but Instagram limited us to 15 seconds at the time. The clips ended with “The Infection begins March 1, 2016! #MSUHvZ.” We also continued to use the same hashtag from last year, #MSUHvZ. 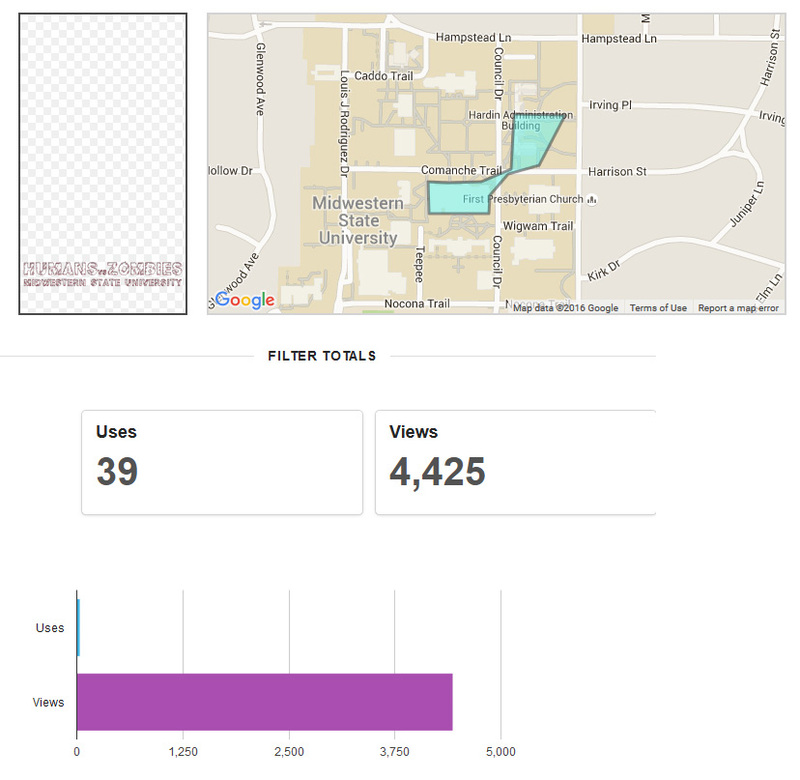 It was an easy way for us to track everyone, plus it was unique to our campus. We worked with the University Programming Council to set up interviews with past players, which included the person who would eventually be the original zombie. Friends shared the videos and everyone was talking about them on campus. On Instagram we received comments, tagging their friends about the game. On Twitter, as the game grew closer, we saw more retweets and favorites from newer videos. In total, we did six videos. Players told us strategies and ideas of how to approach the game. The campus was ready for the game. Over 120 students signed up, and the last push was two days before the game began. We put a lot of media out on Twitter, Instagram and Snapchat. On Snapchat we had been putting information about how to sign up and where to sign up during the day, but it wasn’t until the night before that we did anything major. We created a video of the transformation of our original zombie, which had been chosen earlier that day. The Snapchat video never showed her face, and had over 367 views by the end of the night, rounding out to 501 views by the end of the 24-hour lifespan. We also included another YouTube video showcasing the zombie transformation, featuring MSU chemistry professor, Dr. Chris Hansen. The opportunity to get a real professor involved, just gave the game more traditional value, and he was happy to be involved. This video was sent out earlier in the day before the game began, but it was also shown to the students in the HvZ meeting prior to the start of the game. Using simple science experiments, we created a fun video with some movie magic. The room was filled for the HvZ rule meeting. While mandatory, if you let them know you had class or work, you were excused. If not, then you began the game without some much needed supplies. The rules were very simple. If you were a zombie hit by a sock, you were frozen for two minutes. If you were tagged, after 30 minutes you became a zombie. There would be missions throughout the week that humans had to complete or be risked turning into a zombie. A zombie also had to eat every two days, or they would be erased from the game. Prizes went to the Original Zombie, who was chosen from a drawing; for top zombie; and top human. The prizes were monetary giving a lot of students the drive to win. On Twitter, Instagram and Snapchat we unleashed the original zombies name. Kirsten Durr was the first zombie and ready to win. Fortunately, after the meeting, we found her outside the student center and featured her with a personal message on Snapchat. In the first night, only four humans were turned into zombies. This would easily change as the days went by. Snapchat had just released their on-demand geofilters, so we thought we would try one. This gave us a chance to test out the new tools and do something fun. For five hours and $10.01, we created a filter. While during the first mission, it wasn’t a requirement to use the filter, it was a way to promote the game to the university to let everyone know what was going on. 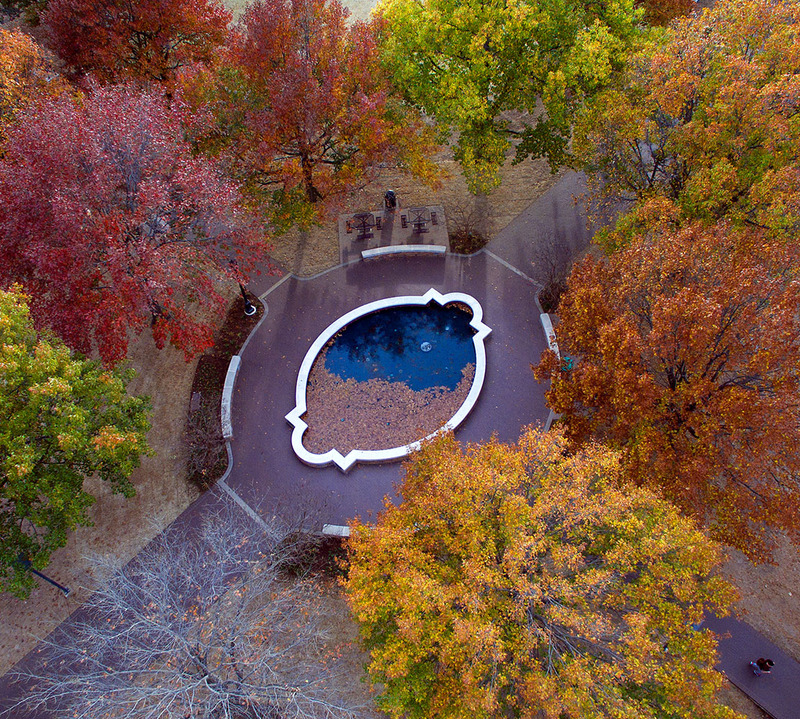 The filter covered our student center and the first site of the mission. As you can see, we had over 4000 impressions with only 39 uses. The first mission was to run to the university replica Liberty Bell and take a picture with it and tag the University Programming Board. We also asked them to use #MSUHvZ, but this wasn’t a requirement. The first mission was done on the second day of the game, with the mission description sent over Twitter and Instagram. We retweeted UPB and sent another announcement on Snapchat. From noon to 5pm that day, you had to complete the mission or become a zombie. Those who got there early, didn’t have to face zombies. Students who got there late, had to make a run for it. Some exploited the rules to their advantage. And to add some clarification to these photos. Students who had bandanas on their head were zombies, and students with bandanas on their legs or arms were humans. Since the replica Liberty Bell is outside the administration building, the HvZ discussion began to spread by word of mouth. Even our staff had to pose with the zombies. We even through it out on Facebook, so alumni and other students would know what was happening. 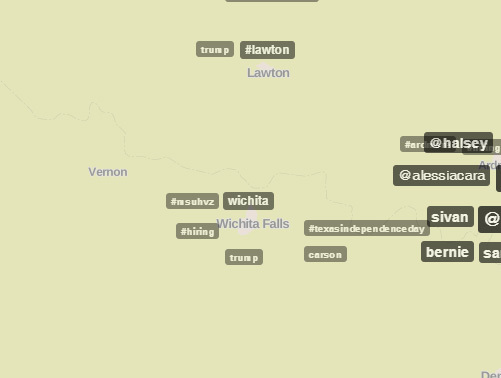 We were trending in the Wichita Falls area for the day with #MSUHvZ. After the first mission, a lot of students were now zombies. The curfew on the game was midnight, so every night on Snapchat we would show a clip from a famous zombie movie about surviving. This included”Warm Bodies” and “World War Z.” We received quite a few smiley faces through Snapchat messages after each one. As the days went by, the game lasted a little longer than we hoped. I would actually have to leave for a conference before the last human was found. I relied on University Programming Board’s advisor, Mario Ramirez, to get pics and video of the last moments. The best part of the whole game, was the level of involvement we had from our university president. She is very active with the student body and knows us very well. As part of her weekly series, Mustangs Minutes, we did a HvZ feature about the game with Juan Mercados, a student from the University Programming Board as the interviewer. The video was one of the most talked about video on campus for the next week. Students, faculty and staff were asking how we did this and how we got our president, Dr. Suzanne Shipley to run in the video. We didn’t, she did this herself, and we caught it all on video. This is where as a videographer, it’s best to know where your subject is at all time. Once the video hit, everyone knew about the game and HvZ was the talk of campus for the second week of the game as it was winding down. While the game is fun, it takes a lot from other social media posts we promote, as they have to compete with one that is trending on campus. With over seven missions throughout the 12 days of HvZ, we succeeded in making this game trend for about two weeks on all of our social media platforms. We did not have a way to track Instagram impressions at the time, due to software limitations. These numbers were over 12 days and included a weekend with very little activity. I also included some number from Facebook, which were the second lowest. While longer were fun, it was the shorter 15-second videos that gave us the most views, plus it was easy to upload them on other social media platforms. The Snapchat geofilter proved that there is an audience for this kind of tradition, and next year, we will utilize it more than before. As for Facebook, we may post a few things on it for the public’s view into the game. When we put out the video and the pictures, we got great feedback and it helped spread the word. Staff and Faculty were asking who was playing HvZ throughout campus. Our video views were low on YouTube, but we did use it when a room full of people were watching. Video is important, but we could have been better prepared. I think a GoPro or a drone would be a fun addition next year, along with possibly using the app Periscope. Other things we learned, is that after the second day, we had quite a few zombies. I think we should have done a little more to focus on the zombies as the game progressed, especially when they became the majority. We focused on the humans, but I think focusing on the zombies for a couple of days would have strengthen the game. This was my second year involved with this. The first year, I was brand new to the university and barely getting my feet wet. I wasn’t able to put much input, but I saw where the potential was for HvZ. The third year, will have more involvement and we will be utilizing the social media ambassadors within the game for a student point-of-view. The students enjoy HvZ, and it gives the campus a fun and exciting spring tradition. If you’re reading this and have questions, please email me at the address below and I would love to talk.